Built in the 12th century, when it was a square keep surrounded by defensive walls. It was then transformed by Pierre Sarriod in 1260 who gave it a polygonal and almost rounded shape that still distinguishes it from the other castles in this area. This ancient estate was heavily damaged by two big fires in the second half of the 19th century, it was then restored in the early 1900s by Sir Gonella, who put the works in the wise hands of architect Chevalley. This fortress measures 2,500 m2 and stands on a promontory protected by the steep gorges of the Savara stream and of the Dora of Rhêmes, and surrounded by luxuriant valleys in a position that guarantees utmost privacy. This estate has been designed with great attention to detail, its halls are finely furnished with period furniture and heavily frescoed in a way that will bring you back in time and take your breath away. This prestigious estate is almost completely covered by frescoes, including walls, ceilings or door frames; they depict pastoral or allegorical scenes, inscriptions and decorations of various kinds, and constitute a priceless artistic heritage. This estate also includes a park, which measures 10,000 m2. 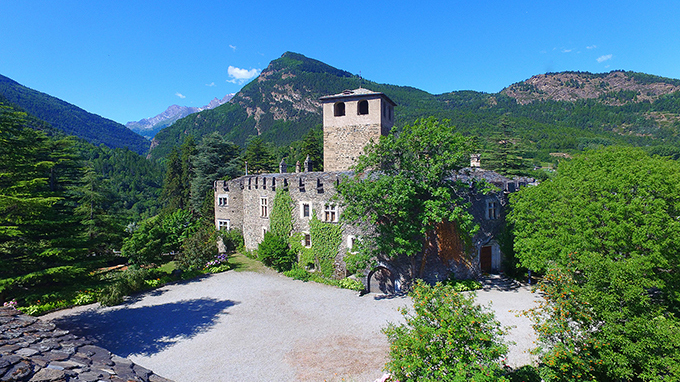 This true dream home is surrounded by the charm that comes from centuries of historical and artistic traditions; it is framed by a land of high naturalistic value, close to the National Park of Gran Paradiso and Mont Blanc. The Aosta Valley is a stunning Italian region nestled among the Alps and surrounded by the four highest mountains in Italy: Mont Blanc, Matterhorn, Monte Rosa and Gran Paradiso. Bordering Switzerland and France, this region has had an important history, playing a main role from Charlemagne's Empire to the Unification of Italy; this region also offers many attractions. Adorned by magnificent historical estates, refined castles, and luxury villas, the Aosta Valley has an important food and wine tradition. The city of Aosta has a rich history, is full of stunning architecture and is famous as one of the cities with the highest quality of life records in Italy. This is a region of great historical value that offers beautiful landscapes ready to be explored: a true haven of rest for you to relax in.